The sky is blue? Well, last time I checked it was going green. We’ve already spoken about flying cars, but that could be a long time off yet. This week we take a look at current, eco-friendly airplanes that use innovative wing design, electric engines and “ionic wind”. Boeing has been excelling itself as of late. Recently announcing both folding and transonic wings! The SUGAR program transonic wings. Working with NASA on the Subsonic, Ultra Green Aircraft Research (SUGAR) Program, Boeing has developed a new wing structure, that gives them the possibility of creating planes with super thin wings. It does this by placing a truss underneath the wings to add stability to the design. The plane is predicted to achieve 0.8 Mach (990 kph or 615 mph). The reduction in fuel consumption in comparison to an early 2000s plane is an estimated 60%. The team at Boeing aren’t the only ones testing this type of design. In September 2018 Chinese airplane manufacturer Comac, tested a similar wing-truss design. The Comac Vplus model plane with a similar wing-truss design. Other exciting news from Boeing came just a few months ago when Boeing released footage of their 777x being joined together. The unique design of the 777x features folding wings. 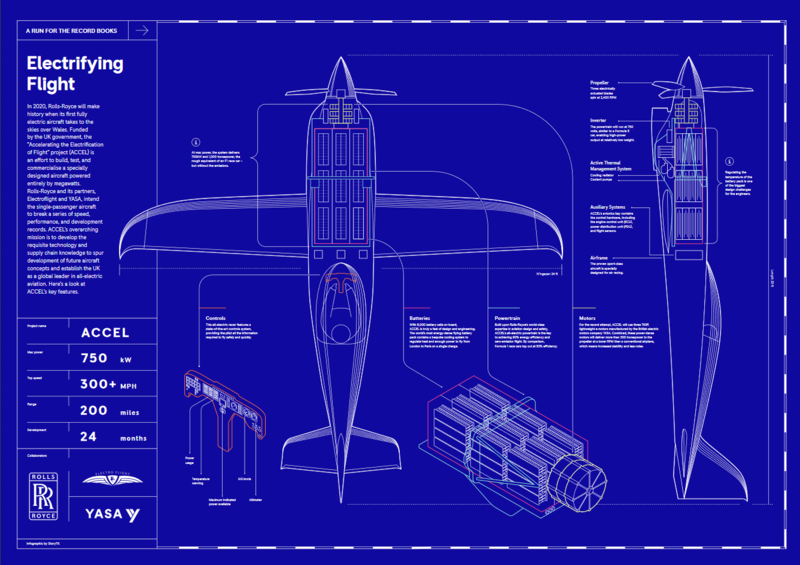 Before now this feature has only been seen on military planes such as the Grumman F4F Wildcat and the Hawker Sea hawk. Hawker Sea hawk with folded and unfolded wings. The design allowed for easy transportation. But what’s the advantage of a folding wing? Well, the Boeing 777x is set to become the largest twin-engine jet plane in the world. This is all because of its super wide 72m (236ft) wingspan. The problem: fitting such a wide wingspan into an airport. 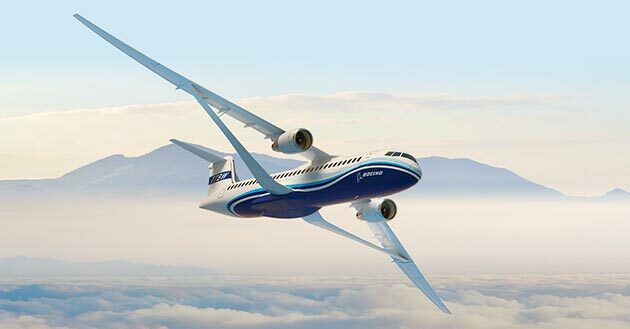 By adding a folding wingtip Boeing have reduced the wingspan to a far more manageable 65 meter (213 feet) span when on the ground, allowing the plane to land in most major airports. The plane is predicted to have a staggering range of more than 14,000 kilometers (8,699 miles) and will be able to carry 400+ passengers. Boeing boasts 12% more fuel efficiency than the Airbus A350. Which has comparable distance and passenger and speed statistics. The folding wingtips are FAA aproved! And don’t worry, the wingtips have locking pins to prevent them folding up during flight! But the super-cool features of the 777x don’t stop at the wings, there will also be a touchscreen flight deck. Boeing 777x touch-screen flight deck. The first planes are set to be tested this year and delivered in 2020. Is it a bird, is it a lightning bolt? 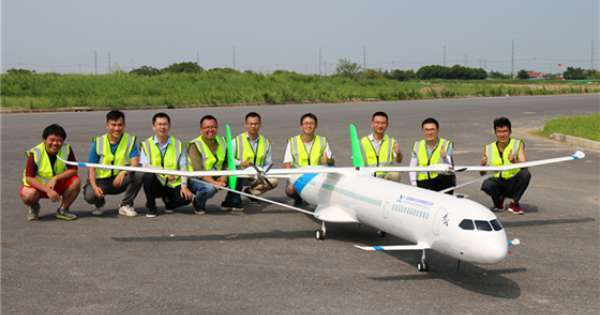 No, it’s an electric airplane! Meanwhile, Rolls-Royce is hoping to break speed records with its electric plane. The current record stands at 338 kph (210 mph), but Rolls-Royce hopes to achieve a cool 480 kph (300 mph). The project is named the Accelerating the Electrification of Flight (ACCEL) project and draws on formula E technologies. “Accel” will contain a battery pack of 6,000 cells running at 750 V with a total power of 750 kW. Rolls-Royce claim that the hardest part will be keeping the battery cool. These batteries will power 3 750R e-motors manufactured by YASA providing 500+ horsepower to the 3 blade propeller. Rolls-Royce claim that the power train will be capable of achieving a 90% efficiency. To put that into context: most Formula E cars only currently manage 50% efficiency. And for those of you that missed it: not to be forgotten is the Massachusetts Institute of Technology (MIT) Ion plane with its “ionic wind” technology. Inspired of course by Star Trek. It uses electroaerodynamic propulsion. 20,000 volts of electricity are supplied to a row of wires at the front of the plane which ionizes nitrogen in the air. An array of aerofoils at the back set at -20,000 volts creates an electric field which draws the ions from the front to the back of the plane. These particles collide with air molecules and creating an “ionic wind” and provides the propulsion. What this means is that the plane is capable of “solid state flight” (it flies without moving parts). It does not require fossil fuels to fly (with the exclusion of the power to charge the battery). Plus, it also benefits from a silent flight. Anyone who lives near an airport can testify that noise pollution is a very real problem. The plane currently only weighs around 2.25kg (5 pounds) has a 5m (16.5 ft) wingspan and flew just 60m (197ft) and around 10 seconds, but there is hope that this technology could be used for drones in the near future. Fancy designing your own airplane? Easy to try, easy to buy, easy to own. That’s BricsCAD. 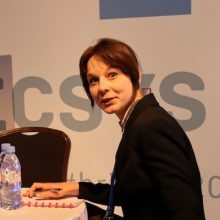 Download free for 30 days at www.bricsys.com. Freedom of choice, plus perpetual (permanent) product licenses that work with all languages, in all places. You’ll love what we’ve built for you with the BricsCAD V19 product family. Boeing, working alongside NASA with there SUGAR program, have developed transonic wings that allow for thinner wings. Boeing has also announced folding wings for their 777x planes. Rolls-Royce is working with Formula E to create Accel: the worlds fastest electric plane. And, the MIT Ion Plane, is the first of its kind to fly without moving parts.